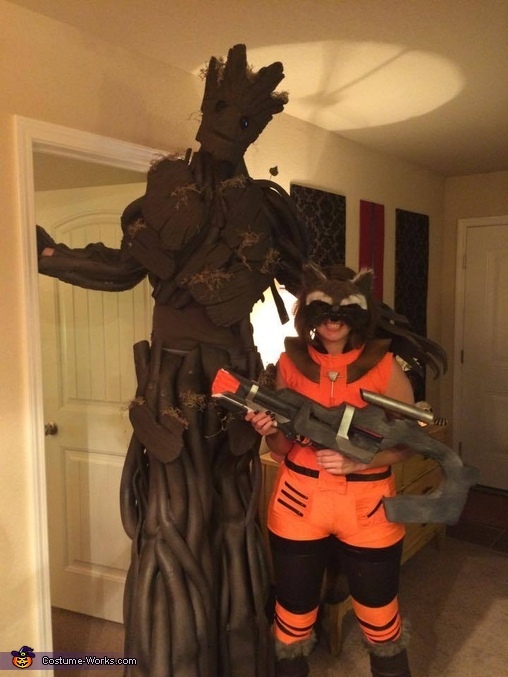 My wife and I decided to dress up as Groot and Rocket from Guardians of the Galaxy. We've always been fans of superhero movies and when this came out we knew we had to replicate these characters. Rocket's costume was make from faux fur for the mask and tons of foam for the gun and vest. Groot was made from pipe insulation from Lowes as well as L200 foam for the face and chest plates. They were then detailed with a Dremel and painted to look like wood. I also hand built the stilts from 2x2's and an old pair of sneakers. I stood about 8ft tall. It was fun to learn to walk in stilts and all our friends enjoyed the costumes.